Napoleon was actually average height. Although it is believed that Napoleon died because of a stomach ulcer, there are some doubts about it. The walls of his house were painted with arsenic, so he inhaled this chemical element all the time. Others believe he was poisoned with "Calomel", a drug which can be fatal if consumed along with almonds. Locks of Napoleons hair were given to some people, and when examined with chemical tests they showed high rates of arsenic. Napoleon’s first wife, Josephine, was 6 years older than him. She was a widow. The letters to his wife are still intact until today. In the potraits of this emperor, he is always in the same position: turned slightly to the side and his hand is placed inside of his jacket. Some people state that this position was due to his chronic stomach pain. 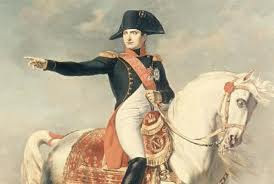 Napoleon is often compared to 2 other leaders in history, Alexander The Great and Adolf Hitler. When Napoleon was a small kid, he totally despised France and its people; even though, he later made a military career serving in the French Army, and after some time he even became Emperor of France. Napoleon could have been a Genovese General instead of a French one had he been born a year before. At the time of his birth, Corsica had only been French for a year, having belonged to the Republic of Genoa before. Napoleon had many lovers in his youth. One of them, Desiree Bernadotte became Queen of Sweden years later. He was married twice: on March 9, 1796 to Josephine de Beauharnais and on March 11, 1810 to Marie Louise. He redesigned Italy’s flag while the country was under his rule. He was born on an island and died on an island. He graduated from the military academy in France and became Lieutenant at a very young age of 16, which is 5 year earlier than most of the soldiers. It is said that he only slept minutes while he was in campaign. Usually he would take naps of between 5 and 10 minutes and wake up fully refreshed for battle. The first defeat of Napoleon was in the battle of Waterloo. Some historians say that, had he attacked earlier in the day, he might have had better odds in the battle, but he was suffering from hemorrhoids and couldn't attack until later. Since Napoleon was a small man with a big ego, he used to say: "A man's greatness is measured from his head to the heavens." Even though Napoleon was a great military leader, there was one man who was able to defeat him several times. Napoleon's nemesis was Horatio Nelson, a British admiral who defeated Napoleon both in the Battle of The Nile and the Battle of the Strait of Trafalgar. Both were naval battles. The Rosetta Stone, a famous archaeological piece that helped archaeologists decipher the Egyptian Hieroglyphics, was found as a direct result of Napoleon's conquer of Egypt. Napoleon’s campaigns are studied at military academies throughout much of the world.